CONGRATS RICK HEARST! 2016 DAYTIME EMMY NOMINEE --ACTOR IN A DIGITAL SERIES FOR "YOUTHFUL DAZE"
FYI, HE HAS WON 3 PREVIOUS EMMYS FOR OTHER ROLES! So, you may want to join both groups, if you haven't already! #GH #GHFCW #GeneralHospital #Liric my photos @rickhearst @haley_pullos event @jimmydee14 http://www.jhbonline.net/tv/id42.html #BringRicBackNOW #TeamRicGH I plan to write a recap, but it may take awhile! Great times at Rick Hearst official fan group... https://www.facebook.com/groups/rickhearstofficialfangroup/ Respectful and fun posts ENCOURAGED! Rick Herbst Congrats Rick Hearst ! Everyone please TWEET! 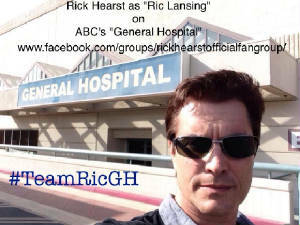 @valentinifrank @carlivatiron ‪#‎BringRicBackNow‬ ‪#‎TeamRicGH‬ ‪#‎GHfan‬ ‪#‎gh‬ @GeneralHospital General Hospital — with Rick Hearst. JHBonline.net shared Rick Hearst's photo. Thanks everyone for consistently supporting me. I am thrilled to be back at General Hospital. Feel free to ask others to join this group as well as tweet to @valentinifrank and @carlivatiron on twitter. If you haven't already liked my fan page do me favor and run over there. Wanna build up our likes. https://www.facebook.com/rickhearstofficialpage. New site coming with lots of content. Vids, Pics, Streaming Interviews, etc. Accidently deleted myself from this group yesterday .... darn ipad! Thanks Rick for bringing me back... oops! 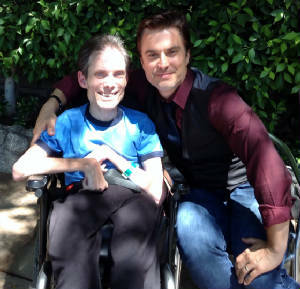 Don't forget to follow @RickHearst @ValentiniFrank & @CarlivatiRon on twitter... See you on GH, Rick! EVENT Confirmed for MONDAY, AUG. 4 Check HERE for details! Wondering what Rick Hearst is up to? We catch up with #GHs ex-Ric in the new issue. I rarely find myself over here and I know that many of you across the world have been looking for ways to be able to connect with me. Come see what I am looking to get global with soon. Re working my website. Most of the content needs to be updated. So, one of the tabs will have a live broadcast channel. Now, no matter where you are. I can pop in from time to time and chat. Many of you are not sure it's me, well here is your chance to get up close and personal. Tell me what you think and pass it on! RICK HEARST 2011 FAN EVENT COVERAGE! Be on the lookout in CBS Soap's in Depth for the article on my directorial debut with Peter Pan. Totally agree with CBS Soaps In Depth Official PageI really don't like that we only see Rick Hearst's Whip (@wildmook) in the opening credits these days. Whip/Taylor marriage needs explored! but glad Rick Hearst will be featured in the April 11 issue-- cant wait! Rick Hearst may not be getting much airtime as #BB's Whip, but we got a glimpse at his secret passion in the new issue. My Friends Rick Hearst &Shelley Hennig (TEEN USA'04) are both pre-nominated for a daytime Emmy: Congrats on your Emmy...pre nom! Loves Bold and Beautifuls new credits! Reminds me of a #MissUniverse opening! Congrats to Cameron Herbst on his acceptance to LA's High School for Performing Arts (LACHSA)! Further congrats to his amazing parents Rick Herbst aka Rick Hearst and Donna Smoot Herbst on raising 2 amazing & talented sons Cam & Older brother, Nick :)! We hope you've been enjoying this new turn in the Whip/Taylor relationship, and Whip stepping up to defend himself and his relationship with Taylor. Rick has done an amazing job with all of this, and it's been a lot of fun to see him get his "edge" back and in full force. Soap Digest has a new poll up, asking for your opinion of Whip and Taylor, and we'd appreciate your participation. Would you like to see B&B's Whip and Taylor together? Yes! They have great chemistry. No. Taylor will always put Ridge first and will never truly give herself to Whip. Vote at www.soapoperadigest.com/insiderpoll/index.html. Check back next week for the results. Click the link, cast your vote, and let's see what happens!! You can also go to leave a Tweet for Rick, letting him know your feelings, at www.Twitter.com/wildmook or writing to him in care of the studio. 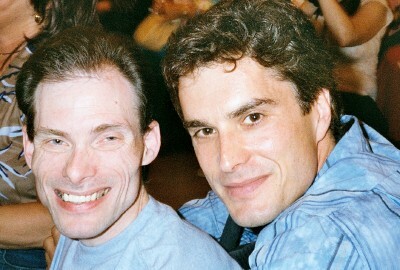 Rick also shares stories and recipes in the new Soap Dishes: The Cookbook, on sale now at www.YourNumberOneFan.com. Go there today, check it out, and place an order so you'll be one of the very first to receive it! Makes a great holiday or birthday gift, or a great "it's been a tough week and I need a treat" gift for yourself!! After all .... who deserves it more?? Via Rick Hearst @Wildmook on Twitter: Greetings All! Big Update! If you were thinking about getting tickets for mine and Brandon Beemer's event for Oct. 22-23 in the N.Y. N.J area, get you tickets now! TICKETS STILL AVAILABLE... So, get them while you can. The Official Fansite of Rick HearstRick Hearst and Brandon Beemer at Brokerage and Uncle Vinny’s! rickhearstfansite.com It’s been a long time since I’ve been out there, and I want to show Brandon how the East Coast isn’t just about ABC. Rick Hearst Hey everyone. Been VERY busy on my business sight, lots of developments. Every week i will be posting a video blog entry to rickhearstfansite.com. Special surprises in store. Presents and giveaways. Make sure you go to HARK's FACEBOOK fan page and "Like" the page. Mission is to get 5,000 followers! Let's make it happen guys! Thanks To Rick Hearst (Herbst) & the entire Herbst family for a wonderful evening at "GREASE!" Nick, Cam, Donna & Rick all did a great job...BRAVO!!!!! I've come up with an e-mail campaign to possibly get RH on Craig Ferguson's show. Daniel McVicar (BB) has been on numerous times (17, according to his site) and I'm asking for RH to be able to join McVicar the next time he pops in on Craig. I told Rick at FCW now that he's a CBS employee again, I wanted to get him on Craig's show!! "Daniel McVicar Needs a Cohort on His Next Visit With Craig"
So go, join in the fun, and let's get Rick booked on late night!! Do you have an idea for what to do for Rick? Share your ideas! Let's get some fun things started!! ABC Soaps In Depth (SID) reports that Ric Lansing will leave GH the week of June 15 and plans to publish an "exit" interview with Rick Hearst that same week. 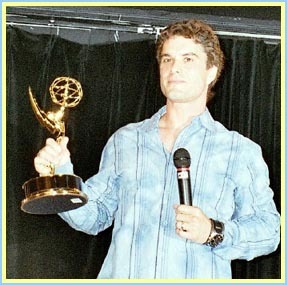 ABC Soaps in Depth to feature Rick Hearst GH exit interview in June 15 issue! Yes, he did a fantastic exit interview with our friend Rosemary Rossi there. I'm very excited to read what they have to say. Then interviews will follow with TV Guide, as well as the CBS SID version. The internet has been buzzing with all sorts of rumors and speculation about Rick, and we can now confirm to you that he will indeed be rejoining the cast of The Bold and The Beautiful, reprising his role as Whip Jones, and will begin airing in mid July. We'll get a more exact air date to you as soon as it is available. Los Angeles, CA 90036. As always, Rick looks forward to hearing from you! Thank you for your words of encouragement and continued support throughout this transition. Everyone has been truly amazing, and we look forward to your coming along with Rick to B&B! It's going to be a fun time! 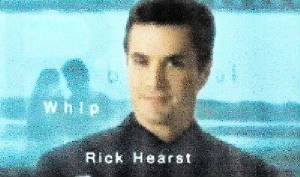 VISIT OUR NEW RICK HEARST HOMEPAGE HERE! Winner of 3 daytime Emmy Awards!!! 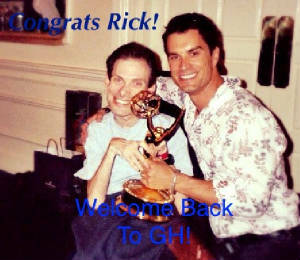 Rick has signed a new, multi year contract with General Hospital, and he is very happy! Your unwavering support throughout the negotiation process was amazing, and we are so very, very grateful. Get ready for some very interesting stuff coming up ... Ric Lansing is here to stay for a good long while! Please drop Rick a note in care of the studio, the fan club, or go to his website at www.RickHearst.com and leave a message on his guest book to let him know that you are happy as well. Rick will also be attending the 2008 Evening With The Stars event on Saturday, October 11, 2208, at it's new venue in the Sheraton Universal Hotel, Universal City, CA. Tickets are $125.00 per person. Go to www.EveningWithTheStars.com for more information on this incredible event! Thank you again for all you do to support Rick! We appreciate it all so very, very much! Binks Is Back! With A New Girlfriend! Bianca's new girlfriend is no stranger to ABC Daytime! Eden Riegel is bringing Bianca back to ALL MY CHILDREN this fall, and she won't be returning to Pine Valley alone! No, it's not Zoe who comes back to town with her — it's GENERAL HOSPITAL alumna Tamara Braun! Riegel will first be seen on Friday, October 17, and Braun will follow on Thursday, October 20, in the contract role of Reece Williams, Bianca's girlfriend. Be sure to check out the latest ABC issue of Soaps In Depth for the exclusive first interview with Riegel about her return — on sale Monday, September 22. Ric – And Rick – Are Sticking Around! Hearst has renewed his lease in Port Charles. GENERAL HOSPITAL's Rick Hearst (Ric) has signed a new deal with the soap "to continue with GH for the forseeable future," says a show spokesperson. Earlier this summer, as his previous contract neared its end, Hearst spoke rather candidly about his feelings Ric and his hopes for his alter ego's future in Port Charles. Now that he's renewed his contract, it sounds like maybe some of those wishes may come true! Following the successful 2007 CD "A Holiday Affair," stars from the ABC dramas "All My Children," "One Life to Live" and "General Hospital" join together to perform a selection of love songs for a new soon-to-be released Valentine's Day CD entitled "A Love Affair." Five-time Emmy(r) Award winner Anthony Geary (Luke Spencer, "General Hospital") makes his recording debut with "Every Time We Say Goodbye," and Emmy(r) Award winner Susan Lucci (Erica Kane, "All My Children") headlines this January 29, 2008 release from Buena Vista Records. The announcement was made today by Brian Frons, president, Daytime, Disney-ABC Television Group. "Music is an integral part of our dramas," said Mr. Frons in making the announcement. "Whether featured performances from today's popular artists or releasing merchandise showcasing the vocal talents of our stars, the audience responds because of their passion for the shows and the artists." "A Love Affair" will be available for purchase at mass-market retailers ($18.98), digital music service providers and online at abctvstore.com. Photos from Rick's 2007 Fan Weekend Event Now Here! More Super Soap '03- added Nov. 5, 2005! Stars from "All My Children" & "General Hospital"
JHBOnline.net:Figure Skating, Pageants, TV, Film, Theatre & more! Info about my favorite sport! About Miss America, Miss Universe, etc. 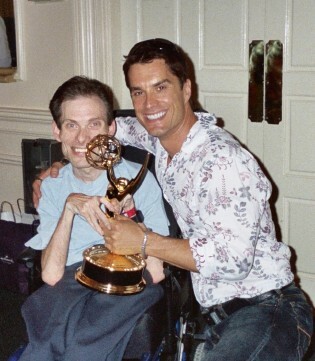 Stars from "All My Children"
2006 EMMY WEEKEND- GH PAGE IS: HERE NOW! GH stars fight childhood cancer! All material Copyright 2001-07 BY JHB ONLINE UNLESS OTHERWISE INDICATED.